www.bling4yrblog.blogspot.com This blog will show the basics of personalising your blog. So you want a little feedback on your blog, what about a interactive questionnaire that people can vote on!!! Nice and simple- go to your dashboard and click on a layout and then Choose a New Page Element. Click on Poll! 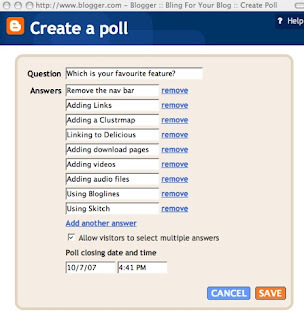 Title your voter's poll and add the questions and then choose the closing time for your poll. Publish! 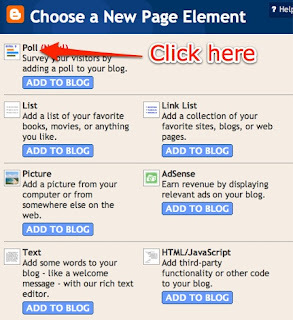 You may like to drag your poll to the place you want it in your layout and save the changes! Easy as! My name is Allanah King and this blog is a place to support you and your class when you blog. I am happy to share this with others but if you use it could you please leave me a message in the comments saying where you are so I get a little feedback. My real life class blog URL is Moturoa Classroom. In 2015 I am working part time as an Blended eLearning Facilitator with the Learning with Digital Technologies PLD for CORE Education and part time teaching at Clifton Terrace School.